Second web release on 2018/10/14: "PA_Survey_v2". This version-2 web release includes reported PAs from 500MHz to 140GHz in Bulk/SOI CMOS, SiGe, LDMOS, InP, GaN, and GaAs technologies. The dataset contains total ~2300 data points with over 1010 data points for CMOS/SiGe PAs and over 660 data points for GaN/InP PAs. The file "PA_Survey_v2" is the version-2 dataset that includes ALL the recorded PA/transmitter data since 2000 over frequency and technologies. 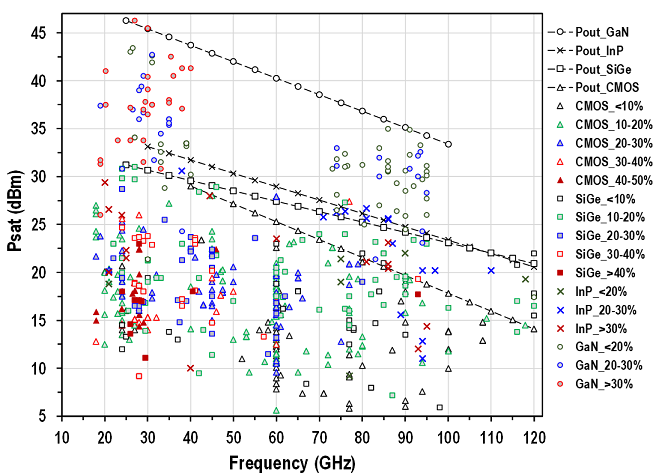 It also includes summary plots on CW Psat vs. Carrier Frequency for different technologies, peak PAE vs. CW Psat at different frequencies, and average PAE vs. average Pout for 64QAM modulations. What is new in version-2 release beyond the version-1 release? (1) PAs from 500MHz to 20GHz, (2) PAs in GaAs and LDMOS technologies, (3) Many more data for CMOS/SiGe PAs, and (4) PA designs in public product datasheets. Acknowledgement: We would like to sincerely thank many of our friends and colleagues for their helpful suggestions and insightful discussions, including Earl McCune (Eridan Communications), Domine Leenaerts (NXP), Patrick Reynaert (KU Leuven), Kaushik Sengupta (Princeton University), Hossein Hashemi (USC), and Brad Nelson (Qorvo). Feedback and Suggestions: We welcome your feedback and suggestions, including the ways to interpret and present the data. In addition, although we try to be as inclusive as possible when collecting these published data, it is certainly possible that we may miss some representative PA designs. Please feel free to send us feedback, suggestions, or missing PA papers. Contact: Please contact us through poweramplifiers.survey at gmail dot com. Do not use my gatech email address, since I may very likely miss your email. Source for this data collection: We focus on peer-reviewed and publicly accessible publications that are typical forums for PAs, including IEEE ISSCC, JSSC, RFIC, VLSI, CICC, ESSCIRC, IMS, T-MTT, TCAS, BCTM/CSICS (BCICTS in the future), APMC, EuMC, and MWCL. We also focus on public product datasheets on PAs/transmitters. Last revised on Jul 19th, 2018.